Offering a sun terrace and sauna, Sport- und Tagungshotel Kenzingen is situated in Kenzingen in Baden-Württemberg. Guests can enjoy the on-site restaurant. Rooms come with a TV. All rooms come with a private bathroom. Sport- und Tagungshotel Kenzingen features free WiFi throughout the property. You will find a shared lounge at the property. You can play tennis at this hotel, and the area is popular for golfing and horse riding. Strasbourg is 43 km from Sport- und Tagungshotel Kenzingen, while Colmar is 33 km away. Baden Airpark Airport is 68 km from the property. 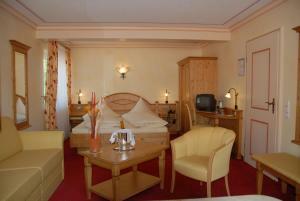 When would you like to stay at Sport- und Tagungshotel Kenzingen ? Please inform Sport- und Tagungshotel Kenzingen in advance of your expected arrival time. You can use the Special Requests box when booking, or contact the property directly with the contact details provided in your confirmation. Guests expecting to arrive after 18:00 have to contact the property in advance of their arrival to secure their booking and to arrange check-in. Please note that the sports facilities and restaurant are closed on Sundays. Guests do not have to pay spa tax at the Sport- und Tagungshotel Kenzingen. Please note that children under the age of 16 cannot enter the sauna area. Please note that on Sundays this accommodation closes at 14:00, guests are kindly asked to contact the property in advance in order to arrange the check-in. Please note that between 11 November 2018 and 29 November 2018 the restaurant will be closed. Lunch and dinner will not be available during this period. Each day we'll check prices and send you an email for your selected dates at Sport- und Tagungshotel Kenzingen. If you don't have specific dates but would like to check prices for say next weekend or say next month we can check the price too. Click to write a review and share your experience of Sport- und Tagungshotel Kenzingen with other travellers.